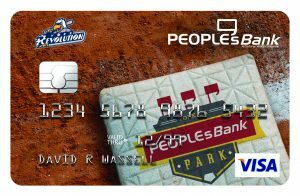 Our PeoplesBank VISA® Debit Card provides fast, easy and convenient access to your funds at any time of day or night! Choose between our classic design or our York Revolution card! MoneyPass – The MoneyPass program is a convenient service that provides clients with access to more than 32,000 ATMs all over the country, fee-free! Visit www.moneypass.com to download their mobile app and find MoneyPass ATMs to avoid surcharges on your next road trip! Allpoint – Allpoint provides you with the freedom to get your cash where you want, when you want, wherever you are…without the ATM fees. With over 55,000 ATMs in the Allpoint Network, your cash is never far away. Just look for the Allpoint logo or download the Allpoint mobile app to find the nearest Allpoint ATM. Visit www.allpointnetwork.com for more information!